We promote Share the Facts widgets in several Twitter feeds and on our Facebook page. Share the Facts (@sharethefact): This feed automatically tweets every Share the Facts widget created by our fact-checking partners. Share the Falsehoods (@sharefalse): This feed automatically tweets a Share the Facts widget any time a claim is determined to be false by one of our fact-checking partners. Share Trump Facts (@share_trump): This feed includes all fact-checks of President Donald Trump. 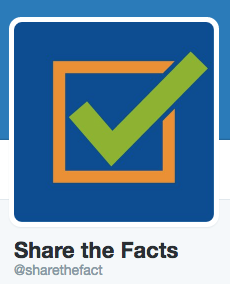 Share the Facts: Entertainment (@sharefactsent): An entertainment-focused feed of fact-checks. Share the Facts Facebook page (facebook.com/sharefacts): This page offers a curated selection of widgets from our fact-checking partners.